CAS students taped Mr. Hernandez (center) to the pole in celebration of their accomplishment fundraising for St. Vincent de Paul. Principal Mungia poses with him for a photo. Each class competed against each other raising both awareness and donations for the charitable society. As an added incentive, the winning class was permitted to chose a teacher to duct-tape to a pole in the cafeteria. 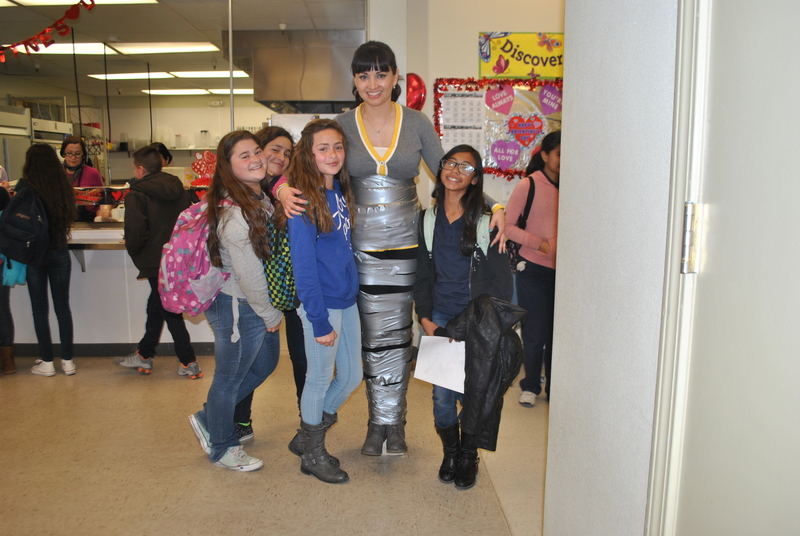 Ms. Hernandez poses with several students who taped her to the pole. Students in the winning class voted for Mrs. Montano and Mr. Hernandez (a tie) and so they taped both to the pole today at lunch time. For more information about St. Vincent de Paul, please visit the organization’s wesbite at http://www.svdpusa.org.